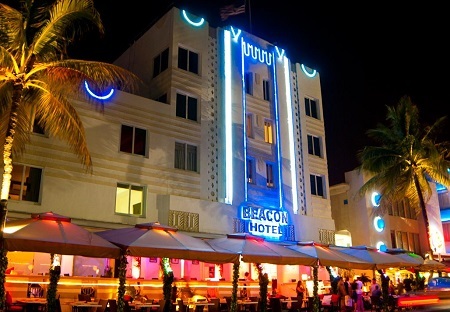 The Beacon South Beach Hotel in Miami, Florida! Bid Per Room per Night and Stay Three (3) Nights! Inventory is very limited. Auction Winners are advised to submit their preferred travel dates immediately after winning the auction. Where can you stay just steps from the beach, while also being in the midst of Miami's best shopping, dining, and nightlife district? 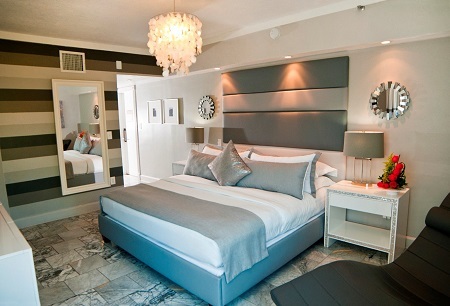 The Beacon South Beach hotel puts the heart of Miami at your fingertips. Our boutique beach oceanfront hotel specializes in personal, quality service that makes you feel like royalty in a palace. Since 1936, our accommodations have been the best way to sleep away the night (or day). Offer is based on single or double occupancy in a One Bedroom Suite for maximum 2 Guests. Our One-Bedroom Suites provide over 500 square feet of space. It features comfortable king size bed in the bedroom and sitting area in the living room. One Bedroom Suites offer breathtaking vistas of the turquoise waters of the Atlantic and popular Ocean Drive. Fully remodeled in 2014, One Bedroom Suites are an excellent choice for a spacious beautifully decorated accommodations at the Beacon South Beach Hotel. Features: in-room safe, free high speed internet access, iHome radio, mini-bar, beach chairs & beach towels, personalized temperature control, hair-dryer, marble floors, room service, free local calls, IP-Phone with voicemail and data-port features, cable TV. Enjoy the crisp, clean decor of the renovated Suite. You will sleep like a dream in your ultra comfortable king size bed. Stay 3 Nights as desired and based on availability. Bid Price is Per Night.